There was little doubt coming into the weekend that Webb City senior Ryan Riddle would be the one to beat in each of the three distance events. A surprise to some, Riddle decided to compete for the distance treble. With his less-competitive event, the 800, coming third, he would still be fresh for his record chases in the 1600 and 3200. 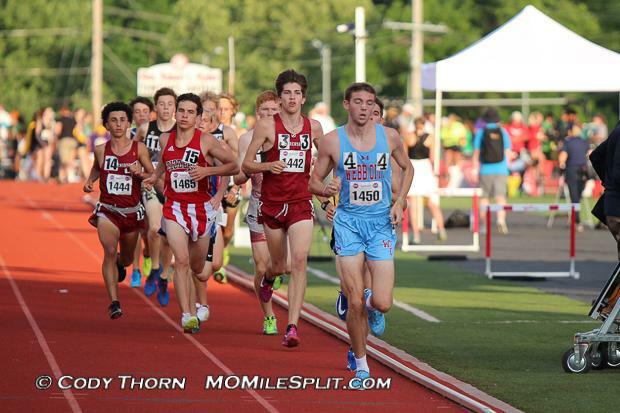 In typical Ryan Riddle fashion, he took the lead from the gun in the Friday evening 3200 and after having some company for the first lap, he opened up a four-second lead as he passed through 800 meters in 2:10 and eventually extended that to 10 seconds as he passed through the 1600 in 4:29. While some may call this a break-neck pace, do not forget that his personal best of 8:56.53 came all alone so he is no stranger to running fast solo. "Coming in I knew I was ranked first, but I still had nerves...but my goal was to try to do what I always do and try get out to the front and keep up the pace each lap." With 800 to go, it seemed the race was over, but that did not stop West Plains senior Ben Stasney and Warrensburg junior Colton Palmer from throwing down 59.84 and 59.96 last lap splits, respectively. Riddle, conversely, came across with 68 and 67 splits in the last two laps, "jogging" by his standards, but he was, as he put it, "still happy with (his) performance." 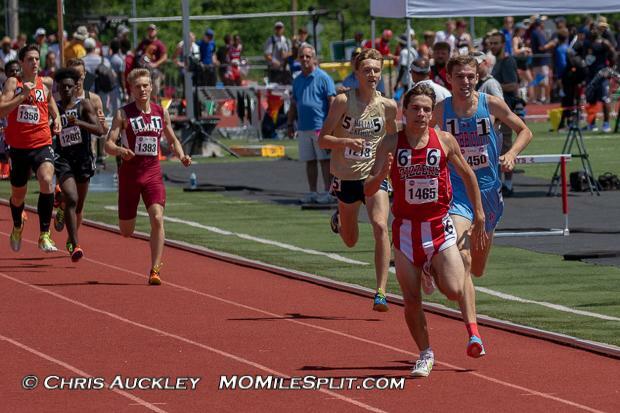 In the 1600, it was Riddle over Stasney again, but this time, Riddle ran 4:08.42, the seventh fastest time in state meet history and fastest time since Liberty's Adam Perkins ran 4:07.9 in 2002. The splits were exquisite in this one as Riddle went 60-65-62-60 and, at one point, led by as much as eight seconds. Stasney would hold off the charge from breakout sophomore from Helias Catholic Jack Crull and grab his third medal of the weekend. Stasney would get his revenge, though, and defend his 800 meter title from 2018 as he held off Riddle for the narrow victory. 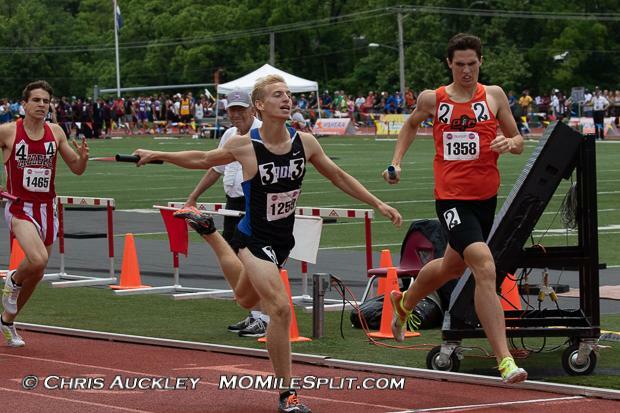 Going stride for stride throughout, the tall and lanky Riddle versus the shorter, stockier Stasney would prove to come down to the final 15 meters as the Zizzer senior was able to put in one last push to edge out the Tulsa commit. 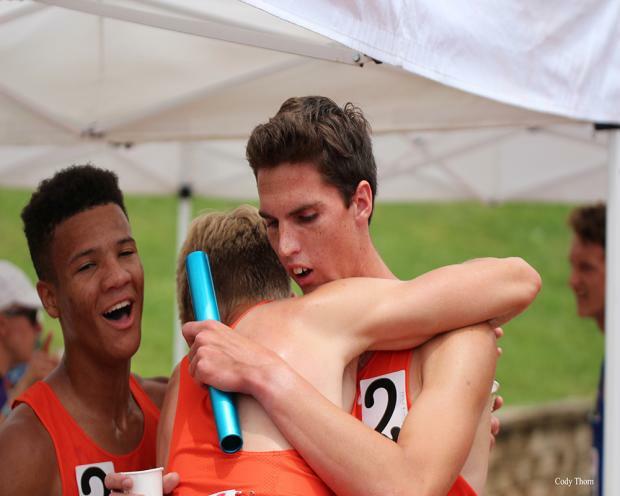 The Platte County boys flew well under the radar this season in the 4x800 relay this season. After all, heading into lasy season, they were never regarded as a high profile program in the event. 2017 was the first time the school had ever seen a sub-8:00 team. On Friday, though, the Pirates brought it all together and shattered their previous school record, running 7:50.03 for the victory. All four boys split under 2:00 with their low-man sophomore Evan McPhatter running a respectable 1:59.7 on the lead-off and Keegan Cordova anchoring the squad in 1:54.45. 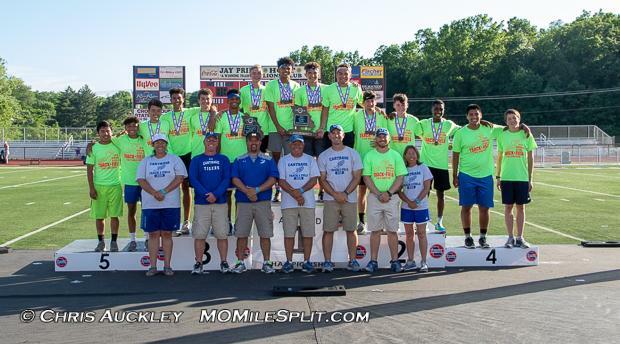 The big story in this one was the margin of victory for the Pirates as they were able to hold off charges from Ladue's Alexander Cobin and West Plains phenom Ben Stasney as Ladue finished second in 7:50.06 and West Plains came across in 7:50.74. Cobin's split was an eye-popping 1:52.90 and Stasney went an equally unbelievable 1:52.22. Not to be outdone, sophomore Jack Crull pulled his Helias Catholic squad up to fourth with a 1:53.41 split of his own. "Towards the end I could feel Ladue on my shoulder," Cordova remarked after the race, "I started getting scared, the crowd was going wild...I was going as hard as I could and my legs started to lock up but I was still able to hold on and they gave me a great fight." A bold prediction at the beginning of the year was that Hillsboro senior Isaiah Martin may score 40 points in four completely different events. 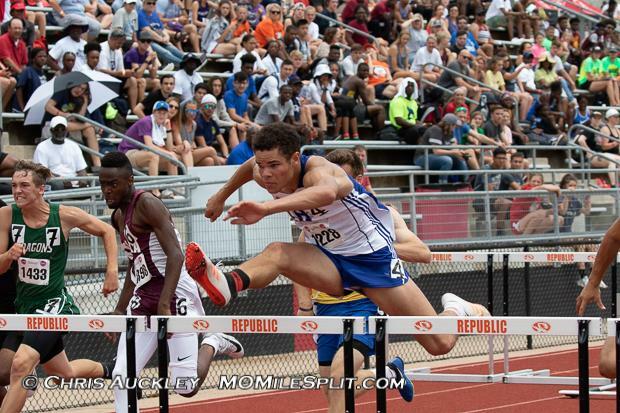 The multi-event and multi-sport star decided on the 110 meter hurdles, 300 meter hurdles, long jump, and javelin for this year's state meet, and though he fell just short in a few of them, still picked up big points for his Hillsboro Hawks squad. Martin started off the day in the 110s on Saturday and finished second to Mizzou commit Jekeel Suber. His 14.27 was a big personal best, but it would mean he would not be bringing in four golds this weekend. "The day started off with Jekeel beating me in the 110s so I couldn't hit that four-for-four, but everything was going okay until I had to run the 300s and throw javelin at the same time and that's when things kind of went downhill." "Downhill" is a relative term as Martin was still able to win the 300s in a time of 37.80, his first career sub-38 mark and his fourth straight year on the podium in the event (second gold). It was the javelin that proved disappointing for Martin by his own standards as he was only able to muster a 176-0 throw, good enough to beat the Class 4 record, but not good enough to take down the huge 181-6 launch from Camdenton junior Gabriel Kurtz. The long jump was Martin's final event and after a long weekend, he told us he had just ran out of gas. He jumped far enough to make finals, but had to settle for eighth with a 21-10 mark. The Hillsboro stud is headed off to Purdue where he plans to focus on the decathlon and hopes to qualify for the Division I National Championships. You've heard of Mighty Mouse. But have you heard of MICDS junior Joshua Sutton? Standing at 5'4", Sutton's presence in the middle lane in each of his races between towering competitors may make the lay-person wonder just how he got there. But then the gun goes and all wonder is thrown out the window. 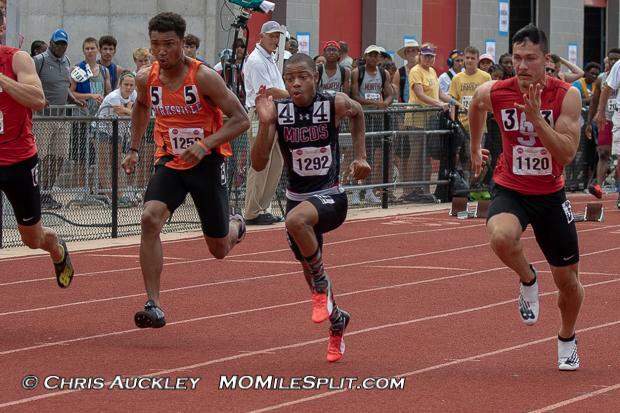 Sutton headed into the weekend in a tie atop the state leaderboard in the 100 with Class 5 star Justin Robinson, with both having run an all conditions 10.60. Sutton, though, would leave with the fastest time overall from the weekend, going 10.62 and blowing away his competition for the victory. Carl Junction standout Weston Wendt would come across in second in 10.83. "(Heading into the 100) I was just thinking to go out, run my hardest, and make sure I didn't false start." A simple strategy, but an effective one nonetheless. It appeared that this strategy paid dividends not just in the 100, but the 200 as well as he was able to nab the win there, too, going 21.25 and once again blowing away the field. Wendt would finish second once again, this time running 21.75. "I thought I would run it a lot slower. I actually thought it would be my worst race because of the heat"
21.25 is the No. 1 time in the state, No. 2 all conditions, so for Sutton, the confidence level should be much higher heading into 2019 as he looks to defend the 100/200 double. 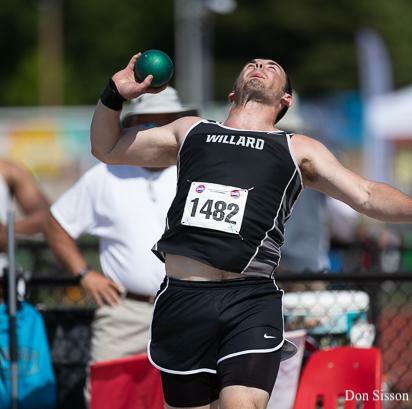 For years, Willard track and field has been synonymous with Olympian Jason Pyrah, but now, you may have to add Nathan Swadley to that list. Though he is not an Olympian yet, the Missouri S&T commit may be one to watch. Swadley capped off an impressive career with the state title in the Class 4 shot put, throwing 59-5.75, and the discus with a 189-3 mark. He finishes the year undefeated in both throws events, going 20-for-20. He also finishes his career with eight all-state medals across three events, earning his first two golds this weekend. "It wasn't my best (discus) set of the year, but I came out with a PR and what would have been a PR, so overall it was a great day and I was proud of it." He also competed in the javelin and while he ends the season with a 172-1 personal best from April, he was unable to meet that mark on Saturday as he finished 15th with a 135-8 throw. Boys Triple Jump: The Carthage duo of Arkell Smith and Taris Jackson went 1-2 in this one, scoring a big 18 spot for the Tigers. Smith jumped 47-1.5 while Jackson, a sophomore, ended his season with a 45-10 personal best. Jerald Allen: One of the big stories from the offseason was the transferring of Jerald Allen from Class 2 Cleveland NJROTC to Class 4 Gateway High School. The 400/800 star did not disappoint as he took second in the 400 (48.51), fourth in the 800 (1:56.55), and ran legs on the sixth place 4x400 and eighth place 4x100. Boys Pole Vault: Desoto's Mayson Derousse won by over a foot in the Boys Pole Vault as his 15-3 clearance was well beyond Liberty Wentzville's Nolan Bone in second (14-3). Carthage and Carl Junction, both southwest Missouri powerhouses over several sports, battled it out to the end in this one with Carthage coming out on top by five points. Grandview, a perennial powerhouse finished a mere seven points out of first as all three teams traded blows throughout the weekend. On the strength of Ben Stasney and the distance squad, West Plains finished one point ahead of Webb City for fourth. 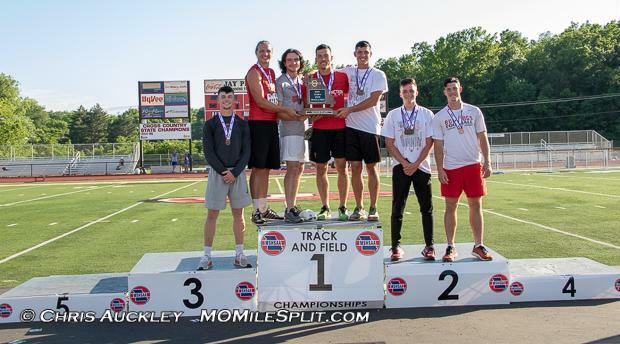 Carthage scored big points in the triple jump with Smith and Jackson, but also grabbed points from Dylan Pruiett's high jump win, Dillon Lancaster's third place finish in the 110m Hurdles, and all four of the relays, headlined by their 3:18.62 victory in the 4x400. 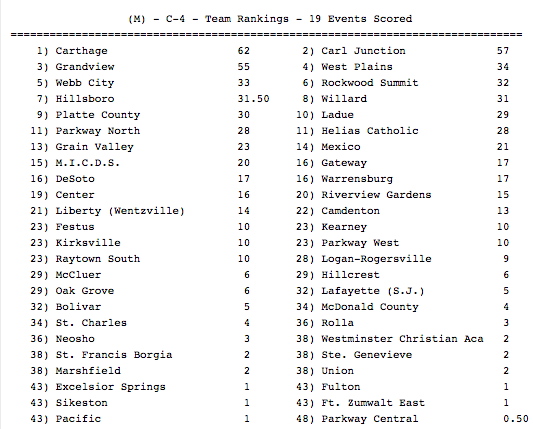 Carl Junction was also strong in the sprints as they won the 4x200 in while taking fourth in the 4x400. Weston Wendt, Sam Repsher, Lance Ward, Lucas Berliew, and Joe Kennedy were all keys to the Bulldogs' runner up finish in both the relays and their individual events. Grandview earned big points from their studs Tre' Manning, Christian Turner, TeAndre Skinner, and Justice Akinmoladun. The throws crew of the latter three, aptly named the "Bomb Squad," were crushing it all weekend as Turner took second in the discus and fifth in the shot put, Skinner placed third in the discus, and Akinmoladun was third in the shot put. Tre' Manning ran a leg on the second place 4x200, and placed sixth in the 400 and long jump. D'monte' Blanks picked up a fifth place finish in the 110m Hurdles and Michael Nweke was fourth in the 100 while running a leg on the third place 4x100. West Plains got 32 of its 34 points from Ben Stasney (counting the 4x800) with the other two coming from Jacob McCrackin in the 1600. 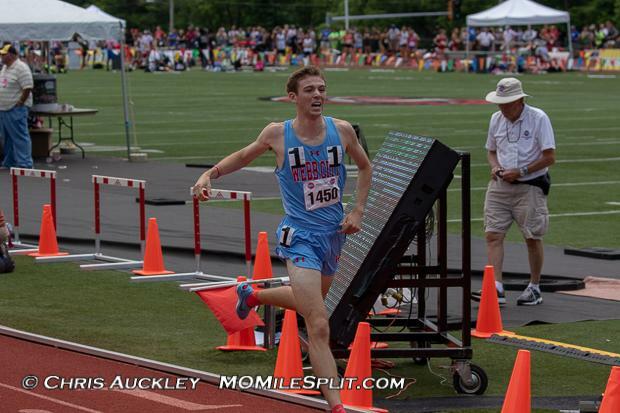 Stasney has solidified himself as one of the top runners to ever come out of West Plains, a program that has already produced some of the best runners this state has ever seen.